The final battle for the Marvel universe begins. The fall of a Galactic empire. The rise of a new one. 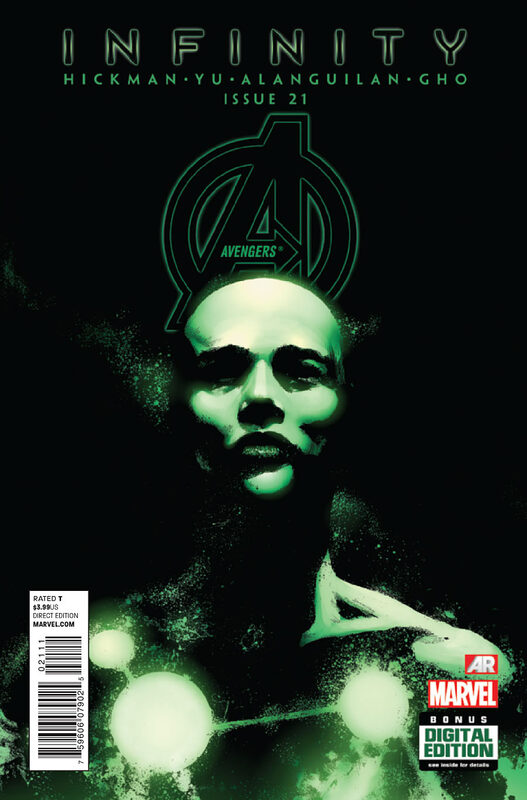 Cover- This month Captain Universe gets the cover top spot in all green hue’s. Honestly I can’t complain about any of these Infinity covers, they all look damn great! Art-Leinil Francis Yu as always delivers big time with seamless art and action and a few emotional scenes that lead to even more questions. Am I the only one who caught Captain America and Captain Marvel having a Cordelia and Angel moment their when they were faced with almost certain death? Story- This issue with the war raging across the galaxy was simply divine! I could not help my spin tingling as the hopelessness of the situation settled in. Then our Deus Ex Machina aka Captain Universe pops out of her “convenient” sleep and almost ends the threat. Hickman has me by the long and dangly bits and I don’t want him to let go! Action- Captain Universe vs the Builders were glorious! Brief sure, but very satisfying. Annihilation Wave- In a sweet bit of continuity we get the Annihilation wave of the negative zone being used as a last ditch attempt at stopping the builders. Our villains however are having none of it and quickly turn the wave against itself. It would have been fun to see the scope of power wielded by the builders. Black Heroes- Awoken from her slumber Captain Universe takes the fight to the builders and almost single handedly ends the threat of the builders. Unfortunately not before the last command is given to the Alephs, destroy everything! With the kid gloves off let’s see how things play out. Continuity- This issue has one builder escaping to another dimension which explains what happens in New Avengers (2013) #11.